We can supply and install security alarm systems throughout High Wycombe, Maidenhead and surrounding areas. Offering a comprehensive service which encompasses everything from design right through to the installation of your alarm and on-going maintenance. Whatever your budget or requirements, and whether you are looking to secure your home, office or larger commercial premises, trust our team to supply a security solution in line with your individual specification. 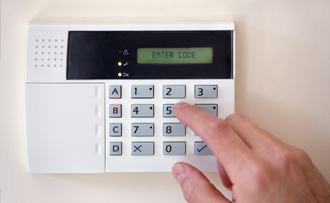 As well as completing new installations, we can also take over the maintenance of existing burglar alarm systems. Whatever you are looking for, rest assured that our expert team can provide it. Can be set up to make noise to scare away intruders or stay silent allowing undisturbed arrival of police on site. Set Times for when intruder detection should begin, so you can set different times daily, weekly, monthly and have different settings for weekends. Can come with combined maintenance services and checks that your system is fully operational. Peace of mind your property or business is as safe as possible. This monitoring service can give you the additional peace of mind that your property or premises are being protected, even when you are away. Combine this with the expertise of our SSAIB-approved team, and you can rely on the alarm installers from Haden Fire & Security to keep your building safe. We can service and maintain a wide range of different intruder alarms, including existing systems which have been fitted by other contractors. Regular servicing and professional maintenance can help to ensure that your alarm is always working efficiently, and is available at competitive rates which will help you to save money. From our High Wycombe base, we can install burglar alarms throughout Maidenhead and the local area. Contact us today on 01494 525183 for more details on any of the services and security systems that we can supply.